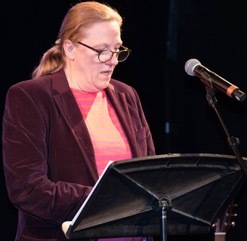 The IAW&A took the stage at the Irish Arts Center for the first time on Tuesday, January 22nd, with a social justice themed Salon, in honor of the Martin Luther King, Jr. holiday. 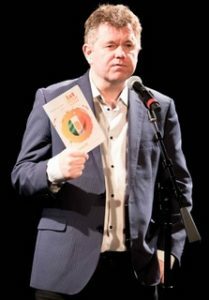 We were proud to have this event included in the Origin Theatre Company’s prestigious 1st Irish Festival held each January and to welcome Origin’s founder George Heslin to our stage. 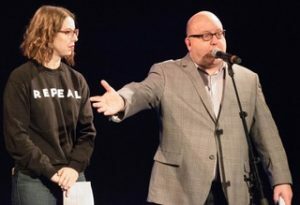 Hosts Miranda Stinson and John Kearns, together with IAW&A Board members Kathleen Walsh D’Arcy and Brendan Costello, invited an accomplished group of artists to participate in an extraordinary, inspiring night. 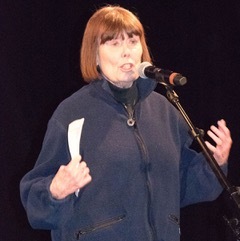 For more information please visit Mary Pat’s website. 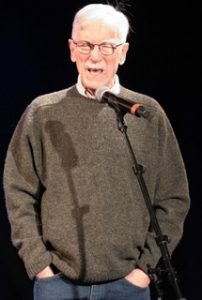 Singer, writer and historian of Irish and Irish American songs, Dan Milner reminded the audience of Irish hard times with an Irish American street song about the Great Depression of 1875. Look for Dan’s new book, Unstoppable Irish: Songs and Integration of the New York Irish, coming from Notre Dame University Press this spring. 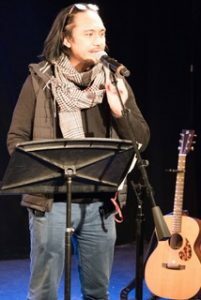 An internationally heralded novelist, a widely published poet, community organizer and New York Foundation for the Arts Fellow in fiction, Bino Realuyo read from his recently completed poetry collection titled The Rebel Sonnets. 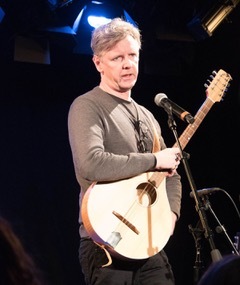 Musician Michael Brunnock performed two songs from his Roger Casement song cycle, using Casement’s own words from poems, letters and diaries to tell his story. An Irish patriot executed in 1916 for his role in the run-up to the Rising, Casement was a diplomat who exposed the enslavement of people in the Belgian Congo, and of tribes in the Amazon. 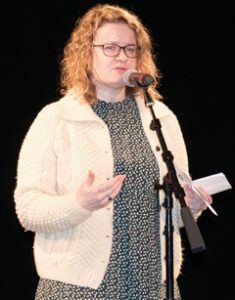 Native New York theatre artist Guenevere Donohue gave an excerpt of her musically driven performance piece, Killer Is My Name, inspired by Sophocles’ Ajax, and set in the Bronx. 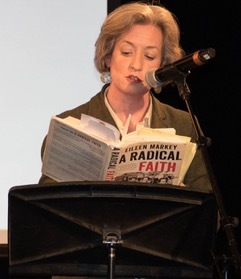 Killer tracks warrior culture through stories of Guen’s father who was a Marine, ironworker and covert agent for the Office of Naval Intelligence. 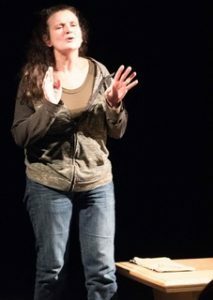 Guen produced, directed and performed the piece at the Boulder International Fringe Festival. 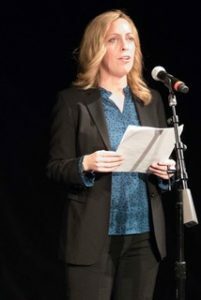 Honor’s play Round Room will have a reading at Irish Arts Center in March. 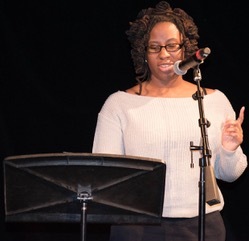 Sherese Francis’ chapbook, Lady Liberty Smashes Stones, is a collection of thoughts on “liberty, freedom and resistance.” She read a selection of poems from it, performing some for the first time. They included “Fingertips Filled with Light (In Memory of Harriet Tubman),” “The Liberty Way (A Code of Conduct According to Liberty University),” “Counter Pied Piper Religion and Politics.” A southeast Queens-based poet whose work has appeared in many journals and anthologies, Sherese is also a speculative fiction writer, blogger, workshop facilitator and literary curator. 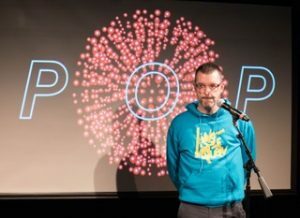 Members of THISISPOPBABY introduced their groundbreaking entertainment combining “popular culture, counter culture and high art.” Known for their legendary arena at Electric Picnic Music & Arts Festival in Ireland and long-term collaboration with drag queen Panti, their latest international smash-hit show is RIOT. 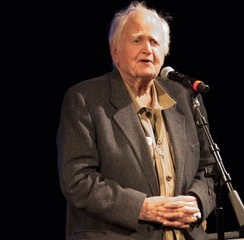 Malachy McCourt, always a fighter for free expression and human rights, had the final words and ended a very full night with a song.